Sugarcane farmers in Uttar Pradesh, Maharashtra and Karnataka are angry because the state governments and sugar mills have not agreed to their demands regarding cane prices. Farmers in Uttar Pradesh and Maharashtra want their governments to fix the state advised price (SAP) of sugarcane at Rs 350 and Rs 300 per quintal (or 100 kg), respectively, while the governments have set it at Rs 280 and Rs 265 per quintal (see ‘Fixing rates’). Karnataka had not announced SAP by the time this magazine went to press. Farmers in these states say that the increase in the diesel and fertiliser prices has made the crop unprofitable. Uttar Pradesh has not increased SAP this year; it was the same last year. The price war started in Uttar Pradesh in early November with the onset of the sugarcane harvesting season. Of the 135 sugar mills in the state, 110 privately owned mills expressed inability to start crushing operations, saying the price of Rs 280 per quintal was too high. Represented by the Uttar Pradesh Sugar Mills Association (UPSMA), the mill owners asked the government to reduce it to Rs 225 per quintal. They claim that sugar mills in the state are under debt and banks have denied them loans. Since the harvesting had already started in early November, the state government asked the Uttar Pradesh Cooperative Sugar Factories Federation Limited to run its 23 cooperative mills and two corporation mills even if the private mills were on strike. They started operations on November 16 and procured sugarcane at Rs 280 per quintal. But the deadlock in Uttar Pradesh could not be broken, with farmers asking for Rs 350 per quintal. In November, farmers protested across the state, threatening to burn their crops. Farmer, Satyapal Singh in Lakhimpur Kheri district killed himself because he failed to repay a debt of Rs 2 lakh. He hanged himself from a tree, says the district police. Talking to Down To Earth (DTE), the spokesperson for the Bhartiya Kisan Union (BKU), Dharmendar Singh, says, “Rs 280 per quintal is what we agreed for the last year. In the past one year input costs have gone up. 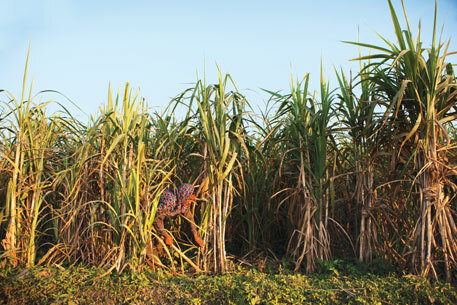 Growing sugarcane is costing around Rs 6,000 per 0.4 hectare. The pesticides used like Corrosioin and Dentos cost Rs 1,600 and Rs 1,500 per 100 g. Farmers are once again at a loss and we will continue to protest till our demand is met.” BKU is one of the largest farmers’ organisations in the country. Sugarcane prices in India are decided by the state governments on the basis of the fair and remunerative price (FRP) fixed by the Centre. Since 2009-10, the Centre has been fixing FRP in place of the statutory minimum support price. FRP is the minimum price that sugarcane farmers are legally guaranteed. The Centre determines it every year taking into consideration various factors like margins for farmers, risks, cost of production, and transportation. The price is linked to a basic sugar recovery rate of 9.5 per cent, subject to a premium of `1.53 per quintal for every 0.1 per cent point increase in recovery above 9.5 per cent. Based on this FRP, state governments work out the state advised price after talks with sugar mill owners and sugarcane growers. Finally, on December 1, UPSMA and the state government struck a deal that the former would procure sugarcane from farmers at Rs 280 per quintal and would pay the farmers in two installments. In the first installment, the farmers would be paid for their produce at the rate of Rs 260 per quintal within 14 days of delivery and the remaining amount, calculated at the rate of Rs 20 per quintal, would be paid at the end of the crushing season in April-May 2014. In return, the state government has agreed to waive off commission, purchase tax and entry tax for the mill owners, translating into a benefit of Rs 11 a quintal. The millers promised to start their operations by December 7 across the state. Singh complains that farmers’ representatives were not consulted when this deal was struck. “This happened despite BKU submitting several memoranda to district collectorates explaining its demands,” he adds. State Chief Secretary Jawed Usmani told the media on December 1 in Lucknow that the part payment provision and tax rebates were given to mill owners because of the fall in the sale price of sugar. It has come down to Rs 29.50 per kg from Rs 36 per kg last year. But the farmers are still unhappy. Talking to DTE, Naresh Kumar of Bhandora village in Muzaffarnagar district of Uttar Pradesh said, “Sugarcane is a long-duration crop and takes around nine months. In terms of sugar produced, our crop gives the highest yield in the country, but it is becoming unviable to grow. There is a daily power cut of 12-16 hours and diesel prices are sky rocketing. Besides, the recent communal violence has created an acute labour shortage in the area. Labourers are charging over Rs 350 per day.” He adds that the average cane yield varies from 1.2 tonnes to 5 tonnes per bigha (0.4 hectare) and sugar production from sugarcane from Uttar Pradesh is highest in the country, with a yield of 12 per cent. During surveys in villages of Muzaffarnagar and Meerut, DTE found that small farmers were being forced to sell sugarcane to local kohlu’s (jaggery units) at Rs 200 per quintal, as private sugar mills have refused to buy their crop. But farmers like Naresh who have over four hectares of land are looking for local traders who can sell their sugarcane to mills in Haryana as they offer a better price than the mills in Uttar Pradesh. The farmers say the issue is a political one and their voices always remain unheard. The protests spread from Uttar Pradesh to other cane-producing states of Maharashtra and Karnataka. In Maharashtra, the government on December 4 decided to constitute a 14-member Sugarcane Control Board under the chief secretary. This is being done as per the recommendations of the C Rangarajan committee, which was appointed by the prime minister to look into the issues relating to the deregulation of the sugar sector. The Maharashtra Cabinet has decided to introduce Maharashtra Sugarcane (Purchase and Supply) Ordinance 2013 in the Assembly session beginning from December 8. The new piece of legislation, which is also based on the Rangarajan committee recommendations, proposes that 70 per cent of the industries producing sugar and other byproducts of sugarcane (like bagasse, molasses and pressmud) should use 70 per cent of the overall income for payment to farmers, while those industries which produce only sugar should allocate 75 per cent of the income for payment to farmers. The ordinance also had a provision for levying a fine of Rs 25,000 or one year imprisonment for anyone who flouted these rules. However, some ministers from western Maharashtra’s sugar belt objected to this, after which it was removed from the final draft, a Cabinet minister said. Mill owners in Maharashtra have agreed to purchase sugarcane at Rs 265 per quintal against farmers’ demand of Rs 300 per quintal and would pay the farmers in installments. Maharashtra farmers, who have been protesting under the aegis of a farm organisation called Shetkari Sangathan, and Member of Parliament Raju Shetty, have agreed to this price till the ordinance comes into being. In Karnataka, the crisis is still looming large. 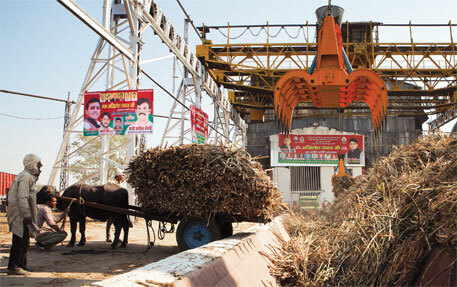 Sugar mills have conveyed to Chief Minister K Siddaramaiah their inability to pay Rs 265 per quintal to cane farmers. A member of the South Indian Sugar Mills Association, which represents the mills, says, “The current sugar price is Rs 260 per quintal and we are already incurring a loss of Rs 40 per quintal. In such a time, we cannot afford this price.” He added that the sugar recovery in Karnataka was just 9.5-10 per cent, while in the northern states the average was above 12 per cent. Of the 59 sugar mills in the state, 53 have started their operations at Rs 260 per quintal.